Introduction to Metabolism. The Black Box of Life. I am currently teaching nutrition and metabolism to first year medical students. The problem in this subject is the large number of individual reactions which leads students to think of the subject the way somebody described the study of history: just one damned thing after another. I try to present the big picture and the approach is the systems or “black box” strategy. The method is to ask whether we can get some information just by looking at the inputs and outputs to a system even if we don’t know any of the details of what’s going on inside. In other words, it is a way of organizing limited information. The method is favored by engineers who are the people most unhappy with the idea that they don’t know anything at all. First, the big principles. Metabolism: two goals, two fuels. There are two major goals in human energy metabolism: First, to provide energy for life processes in the form of the molecule ATP and second, to provide glucose for those cells that require glucose (particularly brain and central nervous system) and to maintain blood glucose at a relatively constant level: too little is obviously not good but too much is also a problem in that glucose is chemically reactive and can interact with body material, particularly proteins when at high concentrations. Of course, metabolism does many things but these are the two major goals in providing energy. A second big generalization is that in this process there two kinds of fuels: glucose and acetyl-Coenzyme A (abbreviated acetyl-CoA or sometimes written as acetyl-SCoA; the S, which is meant to show that the compound contains sulfur, is not pronounced). The black box of life. You knew what we do in metabolism even before you started reading this. Putting it into black box terms, you knew: we take in food and we take in oxygen. We excrete CO2 and water. Somehow this gives us the energy for life as well as the material to build up components of the body. You don’t have to know too much chemistry to figure out the important conclusion that, inside the black box, living systems use oxidation, just like combustion in a furnace. Lavoisier’s whole animal calorimeter that I described in a previous post was a beautiful real demonstration of this black box. More technically, this is an oxidation-reduction reaction. Oxidation, in a biochemical context, means combination with oxygen or loss of hydrogen and reduction means loss of oxygen or gain of hydrogen; we say that the (carbons in the) food gets oxidized and the oxygen gets reduced (to water). Like the common oxidation reactions you know (combustion in a furnace or an automobile engine), this produces energy which can be used to do work. Some work is mechanical work — moving muscles — but most of the energy is used for chemical: work making body material and keeping biological structures intact and generally keeping things running. The medium of energy in metabolism is the chemical reaction of synthesis and breakdown of the molecule ATP. Textbooks frequently refer to ATP as a “high energy molecule” but it is not the compound itself but rather the reaction (synthesis and breakdown (hydrolysis)) that is high energy. For the moment, we can think of ATP as the “coin of energy exchange in metabolism.” A heavy-duty thought concept: the challenge for biochemistry historically was to explain how the energy from an oxidation-reduction reaction could be used to carry out the synthesis of ATP which has a different mechanism (phosphate transfer). The process is called oxidative phosphorylation and was only figured out about fifty years ago. So again, our two goals in human metabolism: Make energy in the form of ATP and maintain a pretty much constant level of blood glucose for those cells, brain and central nervous system, that require glucose (the brain can’t use fatty acids as a fuel). Let’s look at energy production first because it is a little easier to understand. As we look inside the black box, each of the processes uncovered will have its own degree of complexity. In reading this you have to do what scientists do: hang in there. Skip over the parts that seem complex and see if you can come back to them later. 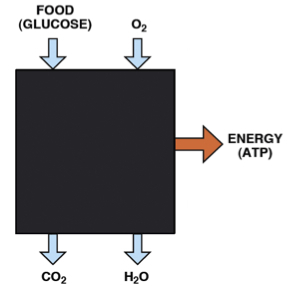 So, breaking into the black box, the first thing to notice is that the oxidation of food is done in steps, and that there is another player that mediates the process by coupling separate pieces: the food never sees the oxygen. The intermediaries are called coenzymes or cofactors. The most important oxidative coenzyme is known as NAD. It’s always referred to by the acronym, but if you’ve had some organic chemistry and you’re curious, NAD stands for nicotinamide-adenine-dinucleotide; the structure is shown in the figure and the action end of the molecule is indicated. NAD coenzymes are derived from the vitamin niacin. So what happens in metabolism is that food is oxidized by NAD+ (the oxidized form of NAD) and the product, NADH (the reduced form) is re-oxidized by molecular oxygen. Although it is still just as we thought (food+oxygen-in, CO2+water-out), the oxygen never sees the food. Why do we do it this way? If we did it all in one big blast like an automobile engine, we would have little control over it and we would not be able to capture the energy in a usable chemical form. It’s easiest to start with glucose, a six-carbon compound. The early steps in metabolism involve a process known as glycolysis (sugar splitting) that ultimately gives you two molecules of a three-carbon compounds known as pyruvic acid. Pyruvic acid is oxidized to a derivative of acetic acid, known as acetyl-CoA. The CoA is short for Coenzyme A, a complicated molecule but, like many coenzymes is always referred to in this way so it is not important to know the detailed structure. The compound is frequently written acetyl-SCoA to emphasize that it is a thioester (sulfur ester); again, the “S” is not pronounced. Where do we get Glucose and Acetyl-CoA? So far we know: most energy comes from the oxidation of acetyl-CoA and most of the glucose that provides energy does so by first being converted to acetyl-CoA. Where else can we get acetyl-CoA? We’ve taken glucose as synonymous with food but where else can we get glucose from besides the diet? indicates the extent to which the exceptions become important but the overriding principle that has the most impact on metabolism is that you cannot make glucose from fat). So that’s it. You now have a blackbox view of metabolism. I will try to open some of the boxes in future posts. Summary of fuel sources and synthesis and looking ahead. There are, roughly speaking, two kinds of fuels: glucose and acetyl-CoA. Carbohydrates and other nutrients, fat (that is, fatty acids) and protein (amino acids) can supply acetyl-CoA. Glucose is not required for acetyl-CoA and under conditions of low carbohydrate or low total food, fatty acids become the major source of acetyl-CoA. Not all tissues can use all fuel sources. Brain, CNS and red blood cells, for example cannot use fatty acids. Brain and CNS can use acetyl-CoA but cannot get it from fatty acids. Red blood cells only use glucose and, to a first approximation, brain and CNS are also dependent on glucose for metabolism. Under conditions of starvation or carbohydrate restriction, acetyl-CoA can be effectively transported from the liver in the form of ketone bodies. Ketone bodies, then, are a source of acetyl-CoA that can be used by brain and CNS. Red blood cells are still dependent on glucose but the brain’s demand for glucose is reduced by the availability of ketone bodies. There is no dietary requirement for carbohydrate and amino acids can also supply glucose through the process of gluconeogenesis. 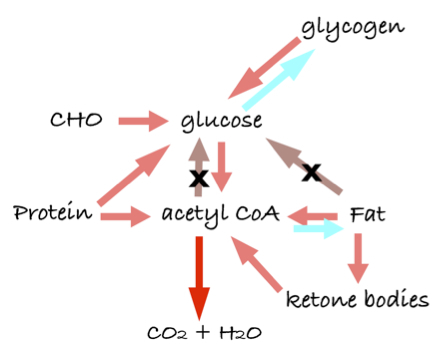 Fat as a source of acetyl-CoA also works the other way: acetyl-CoA can be converted to fat. Whereas glucose can be converted to fat, with a few exceptions, fat cannot be converted to glucose. This will be a key idea behind carbohydrate restriction. Glucose can also be stored as the polymer glycogen. Bottom line is the limitation of “you are what you eat.” Metabolism means the interconversion of food and metabolites. Conversely, it will be critical that not everything is interconvertible. In particular, we will emphasize that you can make fat from carbohydrate but, to a large extent, you cannot make glucose from fat. Glucose from dietary input (referred to as the fed state; in nutrition, as the postprandial period), is depleted after about 8 hours. Glycogen is a storage/supply source of glucose. Liver glycogen can supply export glucose to the blood, thereby supplying other tissues. Muscle glycogen supplies glucose only for the muscle itself. Glycogen may become largely depleted after 24 hours, depending on the conditions (exercise, for example). The third source of blood glucose is gluconeogenesis (GNG) which, as the name implies, makes glucose anew from existing metabolites. Depending on the conditions, the source of carbon may be amino acids, lactic acid or glycerol from fat metabolism. Whereas it is sometimes indicated to be a “last ditch” source of glucose in the textbooks, it goes on all the time. The glucose it synthesizes in GNG may be used to replenish glycogen and only appear in the blood at a later time. Thank you…a fantastic read. I have a question regarding GNG – is glucose production from protein able to adversely affect blood glucose levels if the diet includes excess protein consumption, or is it self-regulated? It is regulated. The net affect is what else is going on and what you mean by adversely. Gluconeogenesis can reduce ketosis so if you are on a ketogenic diet, it could be a problem (if you want to stay in ketosis). Thank you, clearly explained, even I understand, but some questions. With the reactions you describe, how much do we know about them with respect to things like rate, efficiency and what influences them; and for example, how does physical fitness or illnesses affect them? This is the big picture. Each of the processes includes many reactions so this represents the basics of what we know in biochemistry. All kinds of things are known (and unknown) with regard to the things that you mention. There are some biological phenomena that operate on the level of the large systems. 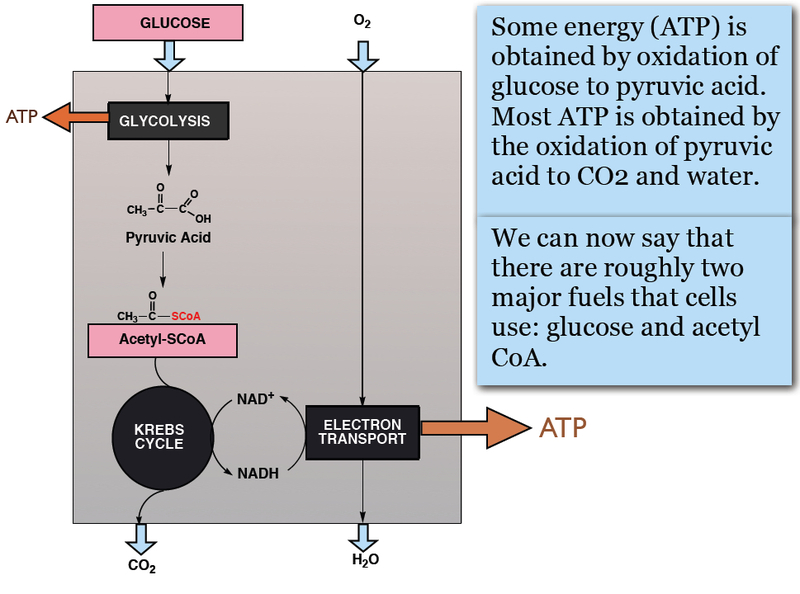 Glycolysis, for example, is anaerobic, has lower yield but is generally more rapid than aerobic metabolism which encompasses the TCA cycle and electron transport. 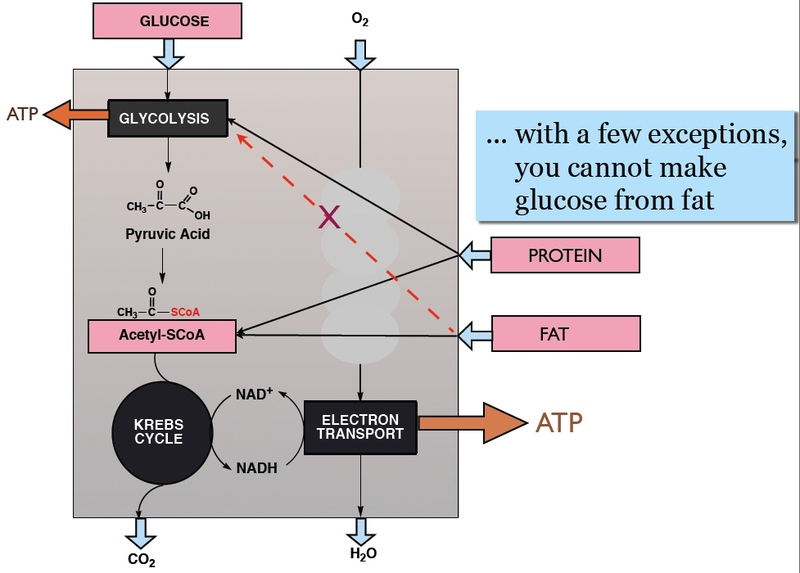 So rapidly exercising muscle (sprint) will rely on glycolysis but in the long term (marathon) must rely on fatty acid metabolism via TCA cycle and electron transport. Similarly, rapidly growing tumors, breast, colon have long been known to be glycolytic possibly related to the hypoxia associated with tumor mass. This is related to the current interest in treating cancer with carbohydrate-restricted diets although the original idea of starving the tumor is probably not right. My colleague, Gene Fine has proposed a novel idea on how ketone bodies may be able to target cancer. “The brain can’t use fatty acids for a fuel”; I actually found some surprising results when I thought to check this. Does this quote mean oxidation of brain fatty acids is elevated in schizophrenics? “Transcripts encoding beta-oxidation enzymes and carnitine transport subunits were significantly upregulated, while those encoding fatty acid synthesis enzymes were significantly decreased. Am I misinterpreting this? I thought beta-oxidation was peculiar to fatty acids. And if not, how is the turnover of brain lipids achieved? And how does brain size shrink in some states and expand in recovery? If the brain synthesises lipids on a daily basis, does it just keep growing forever? This story perhaps testifies to the value of testing recieved ideas in science. I certainly don’t think this finding, if correct, obviates the brain’s requirement for glucose and ketones, or that the brain can run on fat like heart muscle does, but I think it might one day come to be seen as an important factor in how diet and metabolic diseases affect not only cognition but CNS regulation of bodily functions. Perhaps it will provide an additional mechanism linking glycemic diseases and Alzheimers, for example. I agree and as we always say, what we know is less than what we don’t know. I read Chris masterjohn on glucogenesis from fat; who knew there were so many unmapped pathways out there! I think the brain probably puts much of its sugar into fat temporarily to keep energy flow even, and reduce exposure to glucose, just as other organs do. External fats might migrate slowly through the blood brain barrier, performing structural or functional roles or being transformed on the way. They are perhaps incorporated as phospholipids, not triglycerides. This might provide the kind of buffering required, while still allowing energy across. In which case a feeding of fat or sudden release of stored body fat is not going to help a brain starved of glucose. As I say, I (and others) will look into that. Gene Fine’s “adaptive” hypothesis is brilliant. It explains not only why some people (but not others) do well on ketogenic diets, but also perhaps why some cancers improve when other major changes in nutrition or stressors are introduced. If some cancers improve on Gerson diets, for example, its because those cancers had adapted to a very different environment and were thrown by the change… and perhaps different cancers can be pushed towards extinction by many possible changes to their environment, just as animals can. Especially if those changes leave the immune system intact. If the hypothesis applies globally, we would expect ketogenic diets for cancer to be least effective with people already in ketosis some of the time, Gerson diets to be least effective in people who are already raw food vegan juicers, etc. There may be cancers that can be killed off by insulin spikes, though the historical record suggests these are rare. Another benefit of ketogenic diets is increased intracellular levels of ascorbate due to lack of competition from glucose. Cancer Res. 2010 Jul 15;70(14):5749-58. Epub 2010 Jun 22. Low ascorbate levels are associated with increased hypoxia-inducible factor-1 activity and an aggressive tumor phenotype in endometrial cancer. Kuiper C, Molenaar IG, Dachs GU, Currie MJ, Sykes PH, Vissers MC. SourceDepartment of Pathology, University of Otago, Christchurch, New Zealand. Activation of the transcription factor hypoxia-inducible factor (HIF)-1 allows solid tumors to thrive under conditions of metabolic stress. Because HIF-1 is switched off by hydroxylation reactions that require ascorbate, inadequate intracellular ascorbate levels could contribute to HIF-1 overactivation. In this study, we investigated whether the ascorbate content of human endometrial tumors [known to be driven by HIF-1 and vascular endothelial growth factor (VEGF)] influenced HIF-1 activity and tumor pathology. We measured protein levels of HIF-1alpha and three downstream gene products [glucose transporter 1 (GLUT-1), Bcl-2/adenovirus E1B 19 kDa interacting protein 3 (BNIP3), and VEGF], as well as the ascorbate content of tumor and patient-matched normal endometrial tissue samples. HIF-1alpha and its downstream gene products were upregulated in tumor tissue, with the highest levels being present in high-grade tumors. High-grade tumors also had reduced capacity to accumulate ascorbate compared with normal tissue; however, all grades contained tumors with low ascorbate content. Tumors with the highest HIF-1alpha protein content were ascorbate deficient. Low ascorbate levels were also associated with elevated VEGF, GLUT-1, and BNIP3 protein levels and with increased tumor size, and there was a significant association between low tissue ascorbate levels and increased activation of the HIF-1 pathway (P = 0.007). In contrast, tumors with high ascorbate levels had lesser levels of HIF-1 activation. This study shows for the first time a likely in vivo relationship between ascorbate and HIF-1, with low tumor tissue ascorbate levels being associated with high HIF-1 activation and tumor growth. I thought the reason the brain couldn’t use fatty acids as an energy source was that they were too large to cross the blood-brain barrier. But the brain is full of fat, so it must be able to synthesize it. So might this beta oxidation be mostly fat turnover? But then, they used to say insulin couldn’t get past the BB, and then they found it could. I think most of what we’re taught in school will eventually turn out to be wrong, but you have to start somewhere. Usually not wrong so much as not always up to date. I think the low level of fatty acid metabolism is due to reduced levels and activity of specific enzymes but I will look further. Thank you for the post– very clearly explained. Looking forward to more! Thinking about my “with tongue in cheek and open mind” comment about Gerson diets and Ketogenic diets above, it occurred to me that perhaps raw food vegan diets, and high-fat ketogenic diets are not poles apart, at least at the genetic level. Many phytochemicals can be said to “mimic calorie restriction” (i.e. carbohydrate restriction). Naringenin, for example, which I looked at recently, activates the gene for PPAR-alpha. This gene is also activated by calorie restriction, and induces lipolysis and ketogenesis. These kinds of effects could explain why raw food vegans don’t get fat despite a high carb diet. From an evolutionary perspective it makes sense for plants to produce these things; plant-eating insects are high-carb feeders, and interfering with carb utilization through phytochemicals is a strategy to control insect growth and reproduction. Thank you for the continued lessons Dr Feinman. For those of us on a very low-carb diet, there is a question as to where we get the necessary glucose from (for those parts of the body that must have glucose). As you mention that can be from the amino acids in protein (although it has been suggested that this is a rather inefficient means of producing glucose). You have explained that it cannot be obtained from fat (except in some, presumably rare, cases). I used to think that muscle meat that we ate would contain some glycogen, but I saw a video of a lecture by Loren Cordain in which he appeared to disprove this. I can’t recall the details offhand, but it seemed convincing at the time. However, for those of us who consume animal liver on a regular basis, would the glycogen that might have originally been in the animal’s liver survive the slaughtering and subsequent processes, and be available to us? If so, would it go straight to our own liver as glycogen, or would it have to be converted back to glucose (and if so, is this an efficient process?)? In any case, could it be a significant contributor to our essential glucose intake? Slightly related, could any fructose in our dietary intake end up as glycogen in our livers (presumably after conversion to glucose)? For those of us on a very low-carb diet, there is a question as to where we get the necessary glucose from (for those parts of the body that must have glucose). As you mention that can be from the amino acids in protein (although it has been suggested that this is a rather inefficient means of producing glucose). I don’t think it is “although.” It is inefficient relative to directly absorbing glucose but it work’s just fine and in terms of weight maintenance, you don’t want to be too efficient at using food. You have explained that it cannot be obtained from fat (except in some, presumably rare, cases). I used to think that muscle meat that we ate would contain some glycogen, but I saw a video of a lecture by Loren Cordain in which he appeared to disprove this. I can’t recall the details offhand, but it seemed convincing at the time. However, for those of us who consume animal liver on a regular basis, would the glycogen that might have originally been in the animal’s liver survive the slaughtering and subsequent processes, and be available to us? I don’t know much about the details but you would, of course, have to eat a lot of liver to get the glycogen. As in humans, however, glycogen is a function of activity and stress and whereas there are many political and non-scientific issues in the current vegetarian debates, few of us think that animals are treated very well, at least in most places. This undoubtedly affects the level of glycogen. Chemically, glycogen is like starch, except more highly branched. It would be digested and absorbed as glucose. I doubt it just because we eat small amounts. Yes. Fructose can be a source of glycogen, in distinction to Lustig’s YouTube. In my fructophobia post, I pointed out that under conditions of heavy exercise, fructose is preferentially stored as glycogen compared to glucose. Also, on a low carbohydrate diet, any fructose that you do consume will probably be turned to glucose and could be stored as glycogen. I need to thank you for the insights into fructose, which I’ve found useful in guessing how much carb in a carb-restricted diet can come from fruit. It makes the diets of Richard Mackarness, Pendleton, Barry Groves, and other early low-carb pioneers look more spot-on. And those were diets that worked, yet allowed some leeway. http://www.ourcivilisation.com/fat/guide.htm (very short version of Eat Fat and Grow Slim, 1958 Dr R. Mackarness; full version is in link at lower left). Regarding the treatment of animals; I have an ayurvedic friend who won’t eat animal meat because it is full of an “energy of fear” which poisons it. It is generally assumed that such stress is bad for the consumer. I’ve watched Orca killing whales on TV; the whale, quite an intelligent animal, is pursued to exhaustion while being attacked over many hours. It doesn’t seem a quiet or peaceful death. In fact, it looks about as stressful as it gets. Do Orca have shorter life spans than less predatory whales? Probaby not, I imagine that evolution long ago took care of any problems, if there were any. Of course humans are spiritual creatures and will starve for a spiritual belief. And as John Yudkin says, “food that is not eaten has a nutritional value of exactly zero”. Yes. Downstate is one of several schools that use low-carb diets to teach metabolism. Dr. Wendy Pogozelski at SUNY Geneseo (upstate New York) published her description at http://www.healthaustralia.com/download/2.pdf. The hostility towards low carbohydrate, while highly visible in the press and the recommendations of establishment health organizations is far from universal. I interact with many clinicians who are sympathetic in varying degrees with carbohydrate restriction and I wish I had started keeping track of the number of physicians who have told me that they lost a lot of weight on the Atkins diet and have no problem with it at all. Our study of the Low-carber Forums has a reference to a paper on how physicians use low-carb diets themselves but are more likely to recommend low-fat to their patients. I had to copy a blurb from the abstract. I love your methods of teaching biochemistry! the Krebs cycle can be pretty dry to say the least. About 15 years ago, when I was trying to relearn the biochemistry I’d studied eons ago, I went to the Harvard Medical School Coop to browse their textbooks. I decided on one by Thomas Devlin (4th ed’n, 1997) primarily because it included a “Clinical Correlations” box discussing high-carb vs high-fat diets for diabetics. The conclusion was that diets are controversial and there’s a lot of individual variation in responses to different nutrients. But they didn’t rule out high-fat diets. This was so much more enlightened than the then-current panning of LC diets that I was impressed and felt I could trust the author. Book is now in 7th edition, and I have no idea what they say now. According to Amazon’s Look Inside, they do cite the Feinman/Makowskie paper, so they’re obviously at least partially enlightened. The 6th edition is pretty bad. I didn’t see the reference to Feinman/Makowske. This is awesome. Thx a lot, now I understand some things much better. Although the hypotriglyceridemic effect of vitamin C is unquestionable, the mechanism by which ascorbic acid deficiency interferes with triglyceride metabolism is evidently complex and requires further research. So, could we now, or at some point in future get complete scheme of all critical pathways – not only insulin related – of successful fat burring ? Which lowcarbers are we talking about? Insulin (and its friends) are part of metabolism. Insofar as you can generalize, it is the fluctuations in insulin that may be a problem. It is the dysregulation of insulin from large fluctuations in carbohydrate intake that most “lowcarbers” are interested in. Other than what? Different cells burn fatty acids in different ways and fatty acids take part in other reactions and, as in the post, it is acetyl CoA than is the ultimate fuel and, under some conditions, the acetyl-CoA can be re-packaged as ketone bodies. That is what ketone bodies are, a method of transporting acetyl-CoA from the liver to other tissues. Who says that? Lowcarb is high in fat compared to the up-tight recommendations of dietitians. And now HSPH says that “it is time to stop recommending low-fat.” (Funny, I thought it was time to stop right after we started). Our study of the low-carbers forum suggested that lowcarbers did not eat high fat. And what’s a high egg diet…the seventh egg?. And here’s a thought. My guess is the “lowcarbers” are more aware of vitamin C than other folk and more likely to take supplements even if they already have a lot in their diet — what we found in the lowcarber forums study was that the main change responders made was to add vegetables and leafy greens. And some of us, whatever fruit we do have, is predominantly citrus. I don’t think it is “lowcarbers,” whoever they are that is holding us back in broadening the range of research that is funded. Which lowcarbers are we talking about? Many. Not you. For instance http://goo.gl/zUKby and somebody else noticed the problem too (http://goo.gl/CtE6). Its seems all-present for me on various internet places. Other then “insulin prevents lypolis” story that is typically overemphasized in books, tutorials and papers. Paleo diet, for instance, is typically rich in eggs, people eat from 2 to 6 eggs per day. Majority of people I know do not eat more then 2 eggs per week. Yes, that is a thought. It might even be true. I visit substantial amount of forums/blogs etc. I talk here about supplemental C, not veggies/fruits from which you can’t get in best case more then 200mg C, a new RDA proposal by several different researchers including Levin itself, with some promoting higher values ( 500 mg )and all that in healthy state. For instance, my personal communication with Harri Hemila revealed that he thinks based on his extensive research that there is no need to take more then 500mg every other day in healthy state but with disease dosage could be in gram amounts. Now, in my experience, majority of people become obssesed with diet because they have health problems, a chronic disease of some kind. At least in paleo circles main supplement is vitamin D3, not C. Paleo diet is usually low carb from what I see around. Study ? Is there a paper ? Carbohydrate restriction is a principle. I now like to call it the Volek-Westman-Principle. It plays out in different ways. In order to avoid facing this principle, people describe it as a cult as in JAMA’s press release “Despite the claims of various diet gurus….” or “lowcarbers.” If you mean Barry Sears or even many people on the internet, you should say so. I appreciate your making comments on the post and am not particularly offended but it is precisely because we are supposed to defend some straw man that we cannot move forward. “Paleo diet, for instance, is typically rich in eggs, people eat from 2 to 6 eggs per day. Majority of people I know do not eat more then 2 eggs per week.” is the same thing. I am not sure that there is reliable data on what people on a Paleo diet eat. Somebody thought I was vain for liking my own post on the Seventh Egg but re-reading it, I thought it was funny mostly because it accurately portrayed the foolishness of the study — you’re Ok if you eat 6 eggs a week but that seventh egg will give you diabetes. Jeez. If you want to discuss high egg consumption or whatever, better not to attribute it to some un-defined group. That’s what Frank Sacks does. He says in a press conference that he didn’t study low carb diets because nobody can stay on them. Since the person who wrote the press release for JAMA probably never took a course in Nutrition and probably took one course in biochemistry when she was an undergraduate, this is where she will get her information. The group I represent (insofar as any club would have me as a member) wants low carb studied and reported fairly and to have some day a “complete scheme of all critical pathways – not only insulin related – of successful fat burring” and everything else. We have the advantage of some “diet gurus” like Frank Sacks that we have a null hypothesis. If you accurately describe my position on how important insulin is and show me that I am wrong, I will change my mind. The ketone bodies diffuse freely through the plasma membrane of the cell. Could you explain the difference ? Which is correct ? I always thought that ketogenic diet improves neurological symptoms because ketones don’t require transport so neurons and friends bath in energy, while also minimizing stealing from bacterial pathogens which AFAIK can’t burn ketones. It is very unlikely that they diffuse freely since both acetoacetate and hydroxybutyrate exist as anions. The benefit in neurological symptoms is not known but it is possibly related to reduction in poor response (hyper excitability) to high glucose and some kind of enhancement of the endogenous ketone body metabolism — there is support for the idea that glial cells produce ketone bodies for neurons under normal conditions. Also, one of the receptors for beta-hydroxy butyrate is the PUMA-G receptor which is the receptor for high concentrations of niacin used a drug. Additionally, low carb diet makes ascorbate more available which, according to astrocyte–neuron lactate shuttle hypothesis, might ultimately aid in brain energy making. Thanks for this. I look forward to reading this. The neuroprotective effect seems to be in part due to amelioration of reductive stress, i.e. improving the NAD+/NADH ratio. Antioxidant benefits flow on from this as reductive stress can be exported as reduced superoxide radical which proliferates oxidative stress. Note also that glutamate toxicity is ameliorated by GABA and niacinamide is a GABA agonist, supplying another suggestive link between niacin and ketosis. 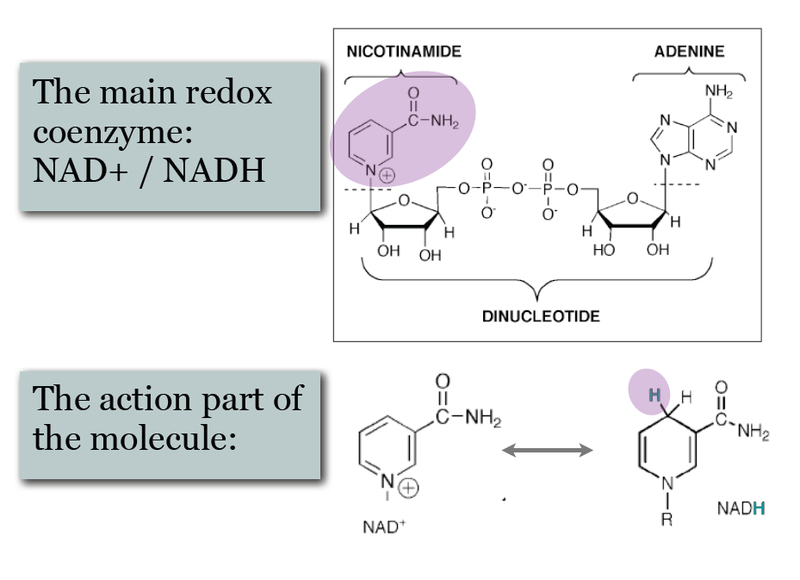 And NAD+/NADH are of course the niacinamide co-enzymes. Neuroscience. 2007 Mar 2;145(1):256-64. Epub 2007 Jan 18. 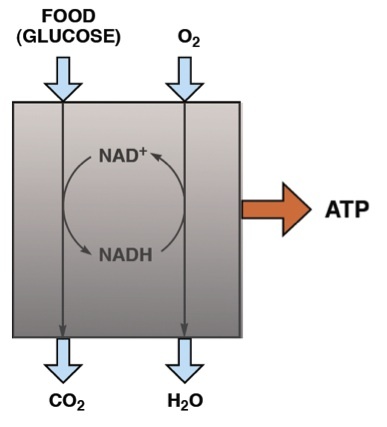 Ketones inhibit mitochondrial production of reactive oxygen species production following glutamate excitotoxicity by increasing NADH oxidation. Maalouf M, Sullivan PG, Davis L, Kim DY, Rho JM. SourceNeurology Research, NRC 4th Floor, Barrow Neurological Institute and St. Joseph’s Hospital and Medical Center, 350 West Thomas Road, Phoenix, AZ 85013, USA. Dietary protocols that increase serum levels of ketones, such as calorie restriction and the ketogenic diet, offer robust protection against a multitude of acute and chronic neurological diseases. The underlying mechanisms, however, remain unclear. Previous studies have suggested that the ketogenic diet may reduce free radical levels in the brain. Thus, one possibility is that ketones may mediate neuroprotection through antioxidant activity. In the present study, we examined the effects of the ketones beta-hydroxybutyrate and acetoacetate on acutely dissociated rat neocortical neurons subjected to glutamate excitotoxicity using cellular electrophysiological and single-cell fluorescence imaging techniques. Further, we explored the effects of ketones on acutely isolated mitochondria exposed to high levels of calcium. A combination of beta-hydroxybutyrate and acetoacetate (1 mM each) decreased neuronal death and prevented changes in neuronal membrane properties induced by 10 microM glutamate. Ketones also significantly decreased mitochondrial production of reactive oxygen species and the associated excitotoxic changes by increasing NADH oxidation in the mitochondrial respiratory chain, but did not affect levels of the endogenous antioxidant glutathione. In conclusion, we demonstrate that ketones reduce glutamate-induced free radical formation by increasing the NAD+/NADH ratio and enhancing mitochondrial respiration in neocortical neurons. This mechanism may, in part, contribute to the neuroprotective activity of ketones by restoring normal bioenergetic function in the face of oxidative stress. Eureka! “majkinetor” has uncovered a rich trove of Chilean Genius (A metabolic switch) and I wish to express my thanks to him and gratitude to you for maintaining this forum for just such dissemination opportunities. Have you had a chance to study the paper? If so, have you posted a review? For others interested in this important aspect of biochemistry, may I recommend the list of citations accompanying that paper (below) and another related paper? I wonder if a variant on latent scurvy might be the syndrome you are looking for, Dr. F. What happens to the switching mechanism if vitamin C is in short supply in H. sapiens …? Organic-Biochem-Nutrition – 3. Aldehydes, Ketones, Sugars.